LOCATION: KITS 360 is one of the hottest new buildings in Vancouver's Westside. Central location right on W.7th at Burrard St, only minutes to downtown, W.Broadway, and major transit routes. 3 blocks to W.4th Ave shopping district. 8 blocks walk to the False Creek Seawall and Granville Island. 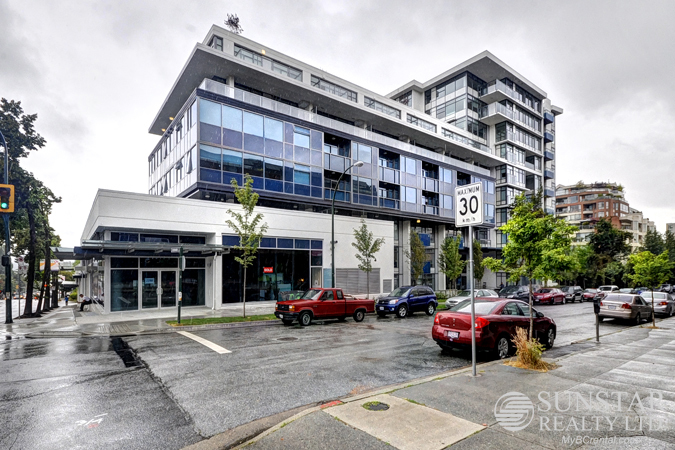 FEATURES: Sleekly furnished modern one bedroom one bathroom plus office condo at KITS 360. Beautiful open kitchen has a breakfast bar, Miele gas cooktop and oven, Blomberg fully integrated refrigerator, AEG ultra-quiet dishwasher, sleek Venmar chimney hood, graphite high gloss cabinets, and white composite stone countertops with matching backsplash. Kitsilano Furnished Condo - Sunstar Realty Ltd.